Carolyn Hatzi, a customer service representative at the Savings Bank of Danbury Main Street Office, has been honored by the American Heart Association with its prestigious Lifestyle Change Award. 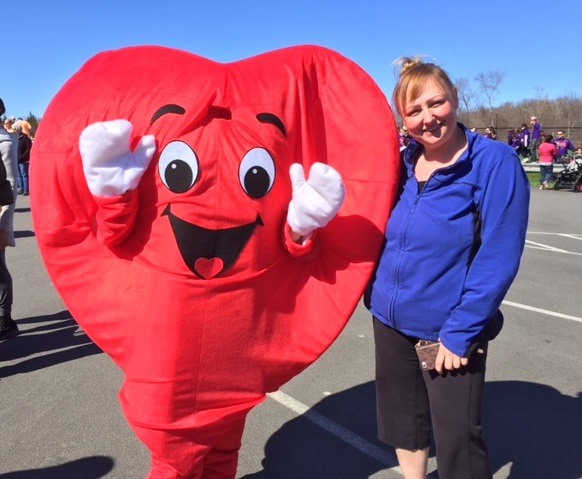 Carolyn, nominated by her co-worker, Carla Pereira, for her hard work and dedication to adopting a healthy lifestyle, was honored at the American Heart Walk on Sunday, April 23 in Putnam County, NY. “Because of Carolyn’s dedication, she has motivated the people around her to also begin living a healthier lifestyle,” said Carla. Carolyn has lost more than 66 pounds; she has increased her physical activity by taking walks regularly after work, taking the stairs instead of the elevator and parking her car further away from entrances. She has also adopted healthier eating habits by joining Weight Watchers, and has inspired some of her co-workers to join as well. Established in 1849 and headquartered at 220 Main Street, Danbury, Savings Bank of Danbury is a mutual savings bank with assets in excess of $900 million. The bank is committed to the communities it serves and to providing exceptional products and services to both personal and business customers. Savings Bank of Danbury has 14 branch offices in Bethel, Brookfield, Danbury, New Fairfield, New Milford, Newtown, Southbury and Waterbury, as well as lending offices in Farmington, Simsbury, Wallingford and West Hartford. Stamford Mortgage Company, a wholly owned subsidiary, has a local office on Summer Street in Stamford. For more information about Savings Bank of Danbury, visit www.SBDanbury.com or on Facebook at www.facebook.com/SBDanbury.